Instead of writing an elongated description please see the photos below which includes a short caption of details. Inlet at the north corner of the lake behind the island. Tom is walking across the lake bed. Water is rushing through due to our high rain fall. Looking back to the north inlet, the amount of sand rather than silt is incredible. The line across the lake is the owners old obsolete electric fence. View from the same location as before but looking to the south end of the lake. 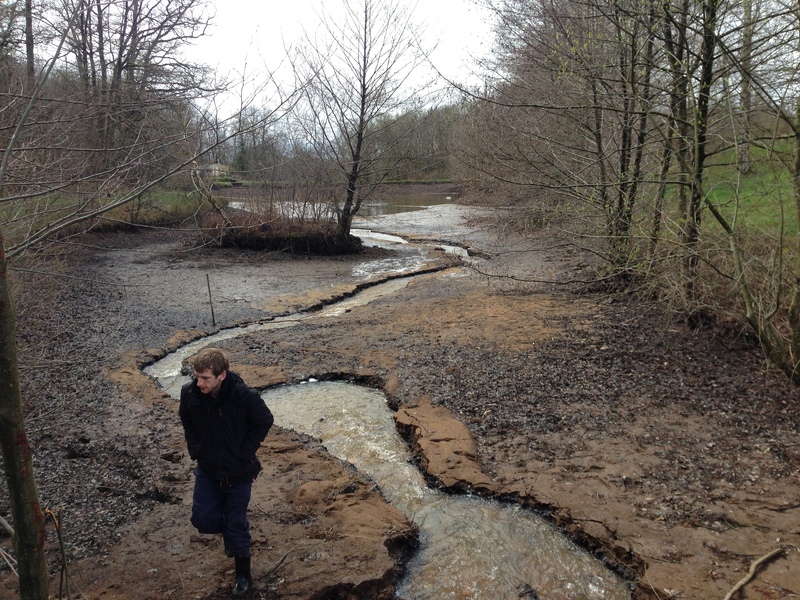 The old river bed continues through the lake bed. 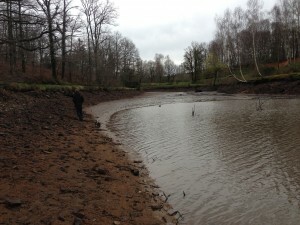 The bank is firm with a mixture of granite, sand and clay. This is where the netting would take place. It is the outlet on the far bank and the deepest part of the lake. Taken from the slope of the lake bed looking to the east end of the lake. 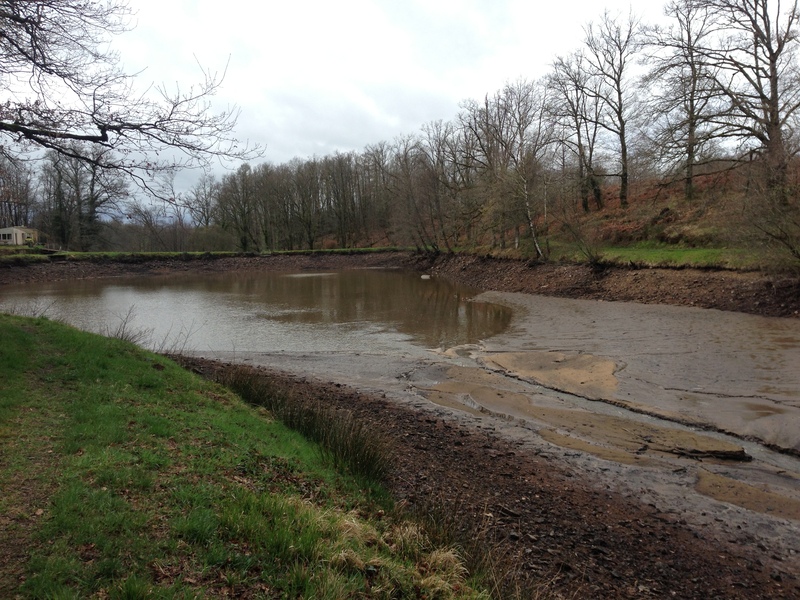 There are two snags visible on the right which we’ll remove when the lake has drained. Tom and Oscar are in front walking along the firm bank. 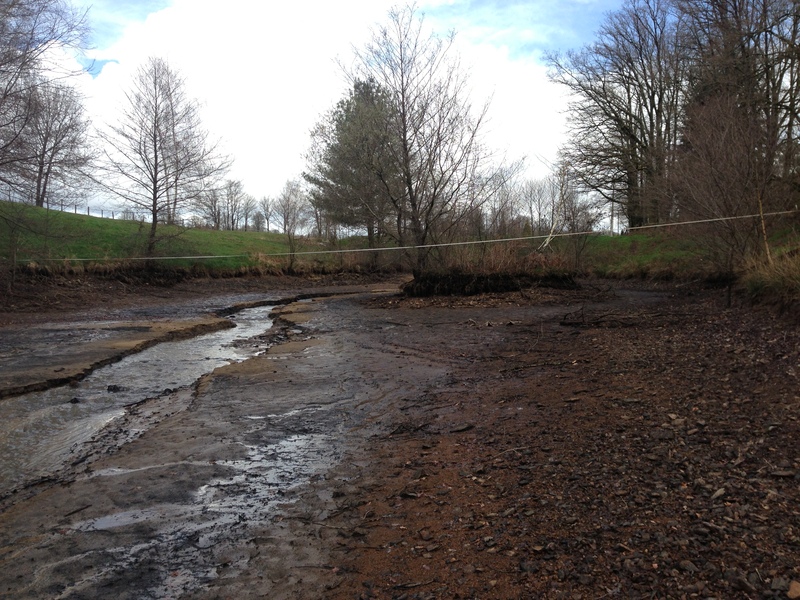 Seems to be some silt at the shallower end, which is not surprising. A sand bank and two large pieces of granite can be seen on the opposite bank. View from the same spot as the previous pic to the south bank and the gite. Another sand bank on the opposite bed. We walked along the bank to the gite just as Jean Pierre pulled up in his car. He greeted us with his typical broad smile and outstretched hand for that usual warm welcome. I made sure my right hand was well out of the way after my little accident. It was so painful. To save time and to alleviate my schoolboy French I had previously looked up the correct French words to briefly explain my injury. Jean Pierre told us straightaway that he had a flask of tea and coffee, so all off to the gite to get out of the rain, and yes we understood in French what was going on!!!!! It was very funny seeing Oscar standing on his back legs looking as if he was helping Jean Pierre to get the flasks and cups out of the back of his car. We sat down at the table in the porch (yes we have a porch!!!!!!) to the gite. A strong hot black coffee would be very welcome on a morning like this. The rain was now heavy drizzle, it was getting colder and grayer by the minute. I am sure Donald has coffee-seeking special powers!! He suddenly materialised in the gite door way just as Jean Pierre started pouring the first coffee. We all chatted together, Tom and I quickly remarking on how Donald was late and how the English are always on time. How rude Donald was for keeping his client waiting!!!! Had to get that one in for pay back for last weeks comments!! It made Tom and I chuckle anyway!!! 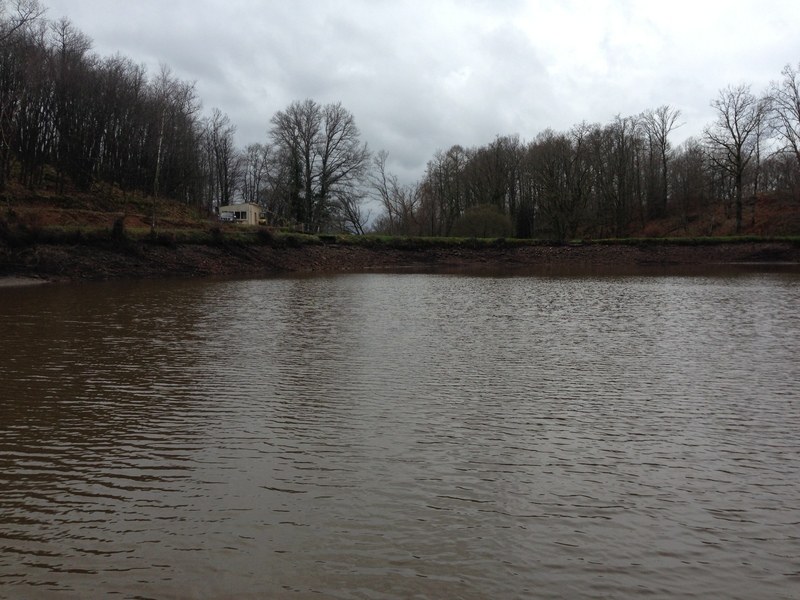 We continued discussing the lake, when it would be ready for netting and how long the water level would be down so we could start clearing snags. Fantastic Donald was here to do some translation. It will prevent any misunderstandings between us and Jean Pierre over the arrangements for a possible netting this weekend and for the clearing work we have to do too. We didn’t know how good Jean-Noël Retailleau’s English was either. I so much regret not learning the language before coming here. I feel very ignorant at times. I noticed Jean Pierre had placed a wine-bottle full of a clear liquid on the table. It was obvious it was not what it said on the bottle???!!!!!!! More plastic cups were produced!! Donald’s conversation with Tom gradually slowed until we were all staring at the mysterious drink Jean Pierre was now tipping with great enthusiasm into 4 clean cups!!! Ideal with coffee apparently but at 9.30 in the morning!!!!!! Yes it was a home brew special! The liquid began to warm just as it passed my chest but it was a nice glow rather than a searing heat. Quite a pleasant warming drink. Completely unexpected from the paint stripper aroma. The taste wasn’t unpleasant either. Perhaps the coating of strong coffee and cigarettes had anesthetised my taste buds. Donald, Jean Pierre and I continued to discuss the lake. It was a great opportunity to get to know the lakes’ history and Jean Pierre too. The conversation, coffee and aperitifs flowed very easily!!! The 20 minutes had disappeared and it was time to meet Tom. As we got to the end of the track I thought I was seeing double!!! I am sure 2 black Navaras pulled into the entrance. Wow that “home brew must be strong”. Thankfully Donald logically deduced that Jean-Noël had the same model and colour of truck as me!! I think I am a bit merry, at 10 in the morning too!!!! We all introduced ourselves to Jean-Noël and his colleague. Then a walk around the lake with Jean Pierre and Jean-Noël leading with the rest of us following. Donald volunteered to remain at the entrance to wait for the digger delivery. Tom asked if I was okay, when I asked why he said that it was a bit weird seeing Donald and I clinging to each other as we walked down the track. Oh my I didn’t realise how strong that stuff was!!! I’ll be totally honest I was very jealous that Jean Pierre was leading the walk with Jean-Noël. I was being ridiculous as up until a couple of weeks ago I had known nothing about the lake and it wasn’t my lake yet!!!! Jean Pierre and Jean-Noël were in deep conversation all the way. We stopped at the gite for some more coffee, where Jean-Noël explained to Tom and I exactly what was discussed with Jean Pierre. The netting was arranged for Saturday, very kind of Jean Pierre to change from Sunday as Jean-Noël is not available on Sunday. As I have said before a lake draining in France is a big social event so it is very good of him to change for us at this late notice. Jean Pierre had guaranteed that the water-level would be at a minimum to allow for the most efficient netting. This is so important to make the job easier and to capture the most fish. He had also offered to net the lake himself as he had done it many times. Jean Pierre didn’t see the need for a professional fish farmer to be paid to do the same job. I told him that was what we wanted and I was happy to pay for the netting and I thanked him for his kind offer. This was our future business. We felt very strongly that it is very important to have this done professionally. We must know what fish are in the lake as it is very important for the future stocking and the health of the lake. A quick chat with Jean-Noël and his colleague to make sure he was happy with the information and arrangements. We all agreed to meet at 9 on Saturday morning. It was great for Tom and I that Jean-Noël English was very good. We both felt very comfortable that he was the right guy for the job and thought that he knew his stuff. Perhaps we can use him for stocking the lake but let’s see how the netting goes first!!!! After we said our good-byes to Jean Pierre, Jean- Noël and his colleague (he was a nice guy too and a carp fisherman) both Tom and I noticed Donald standing next to a digger. Donald had to meet the delivery driver at the cross roads in Paulliac after he received a phone call (I had given MNS Donald’s number because of my bad French) from the driver, who couldn’t find the lake. I can’t believe they didn’t use my google maps link to the lake. We were so pleased the digger and netting both sorted. It was a great relief to get both of these done. Tom had a huge smiley face as he started the digger. A big thanks to Donald too. He was a great help today. Tom and I arrived home early afternoon where I fell asleep in front of the fire. Must have been those aperitifs. It seems I liked it so much that Jean Pierre gave me the rest of the bottle. At least it numbed the pain in my finger for a day!!!! Great day and very pleased with ourselves!!!!!!! !